Often even when the boots we buy fit our feet perfectly, the calves can be a bit too tight and uncomfortable. Fortunately, there are ways to stretch boot calves on some types of boots, depending on the material of the uppers. Here are some of the most common and effective methods. Choose specialized stretchers for calves, because there are different types of extenders, and you don’t want to stretch the wrong part of your boots. Spray the boots with stretching liquid made for the material you are going to treat. If you don’t have stretching liquid, you can use some water and rubbing alcohol to wet the calves. Make sure you always do a test on a small area first, to make sure that the material doesn’t show any signs of damage from the solution used. Once the calves are wet insert the stretcher and turn the handle for widening carefully. It should take about 2 or 3 turns to stretch the calves. Leave the stretcher inside the boots for a day or two. If the boots are made from a delicate material then stretch them for a few hours only. After you test the spray, spray it on the inside of the boots until the calves are wet. Then put some tick socks on or 2 pairs if necessary and put the wet boots on and walk around with them until they dry. If you cannot put them on, use a calve stretcher instead. Leather is one of the easiest materials to stretch. 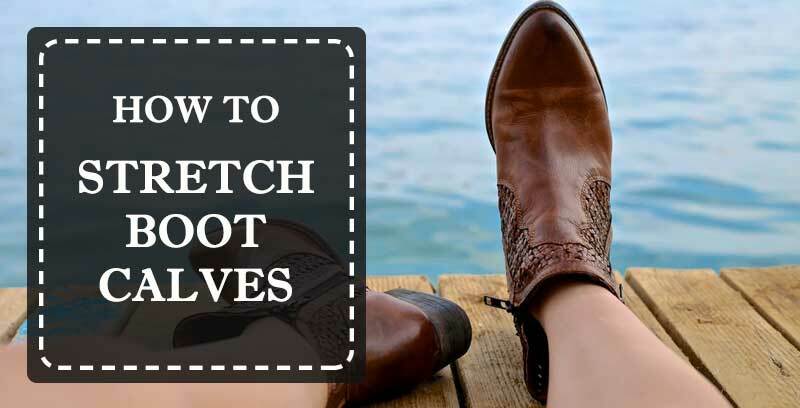 It will stretch over time, but if you need to stretch the calves of your leather boots now, use stretching liquid or rubbing alcohol and water to wet the tight areas, and either use stretchers or wear the boots on with thick socks. You can stuff them with a rolled towel or newspapers as well. If this doesn’t work, take them to the cobblers to get them stretched. You can usually use the same method for stretching the calves of faux leather boots as you would for natural leather ones, but always perform a test with any liquid or other solution you are planning to use on the uppers beforehand to avoid causing permanent damage to the boots. Heat the insides of the suede boots in the calve area with the help of a hair dryer, and then put the boots on while wearing a pair of thick socks. Once again, heat the calve areas for about half a minute while wearing the boots. Walk around until they cool down. If they are still too tight, repeat the process until they are comfortable enough. You can use special suede stretching liquid to enhance the stretching process too. Unfortunately, rubber rain boots are very difficult to stretch, so if you have tight calves you may have to cut them, or simply buy a bigger sized rain boot. Before that you can try one of the following methods for stretching them: put bags with water inside the boots and freeze them in the freezer overnight or fill them with beans and water and let them sit near a heat source overnight.